EYG Commercial says it has been delighted to secure millions of pounds worth of work with contractors across England and Wales it has worked with for the first time. The Hull-based firm is currently in the final fitting stages of a number of contracts which have a total value in excess of £4.3m to the business. And, having recently secured another three contracts on new care home, residential and school developments – each in different areas of the UK, Commercial Director Steve Swallow says the firm is reaping the rewards of a growing national reputation for product quality and development. “The most pleasing thing looking at our order book over the past 12 to 18 months, and ahead later in 2019, is the number of developers we are working with for the first time, and the new locations we have been working in and are heading to,” he said. “We have always enjoyed good relationships with the construction firms and developers we have worked with previously, and that brings in a lot of repeat work, but any business needs to develop new work streams and find new opportunities, no matter how successful it is. “We have done that over the past 12 to 18 months, working for new clients in new locations, and that has given us the platform to prove why we are the perfect choice for specialist glazing projects in any location. 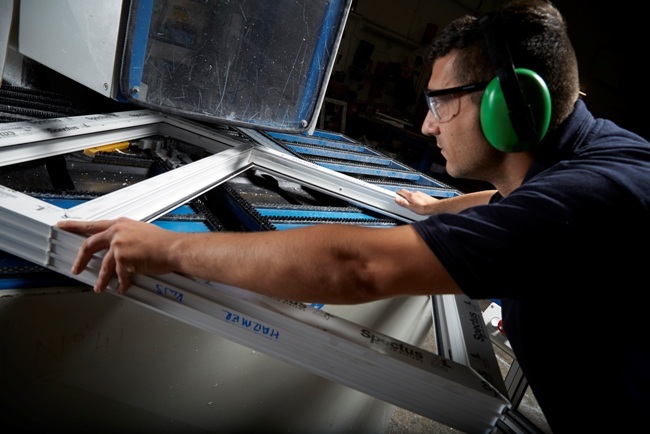 “Over the past three years we have been particularly successful in terms of being chosen on developments where hundreds of windows, doors and curtain walling screens are required. A £24m refurbishment of the Oldways House building in Swansea, Wales, has seen it turned into a 13-storey, 556-bed complex for students, for which EYG has supplied and fitted more than 800 windows. Fitters are currently installing 20 curtain walling screens on the ground floor to complete a £980,000 contract. In Sheffield, South Yorkshire, EYG was chosen by North Midland Construction to ensure curtain walling installed on the new 17-storey Knight House student accommodation development meets high levels of acoustic performance, in a contract worth around £860,000. It has also worked to meet similar demands on a £750,000 contract with Torsion Group, on the new 15-storey ‘Nautical Club’ student accommodation project in Birmingham. It’s expertise with regards to working on new residential developments – and providing windows to ensure excellent energy performance – also saw EYG selected by United Living North to install 270 windows and over 120 double doors on new homes being built as part of the £35m ‘Silsbury Boulevard’ contemporary development in Milton Keynes. EYG started on that £700,000 contact last November, whilst another team headed to Dagenham in January to begin work on a £995,000 contract for Mid Contacting & Consulting Ltd, at the new Robert Clack Lymington Fields School. There, 28 curtain walling screens, 107 windows and 16 double and single sided doors are being installed by EYG, on a £26million project which will see more than 1,500 pupils housed in a combined nursery, primary and secondary school facility when it opens in 2020. “It is really pleasing to see the EYG brand being recommended and recognised for its quality and reliability further afield,” added Mr Swallow.